Can Proper Insulation Save You Money? The main purpose of insulation is to slow down the transfer of heat from one area of your home to another. Even through floors, ceilings and walls, heat always flows from warmer areas to cooler ones. This means that during the winter season, and due to the cold exterior, the heat in our houses flows outside. Similarly, during the summer season, heat from the outdoors, transfers into our cooler interior. To remove this heat, during summer months we run the air conditioner, and in winter we run furnaces to maintain the heat in our homes. This is to ensure a desirable room temperature, but this also means higher energy bills! Does your cooling and heating system run for hours without stopping and without any noticeable change? If so, you should consider adding insulation to your house. Heat moves from a warmer area into the colder area, but adding insulation to your home makes it difficult for heat to transfer, trapping it in the same place. What makes our homes have poor insulation? During the times when heating and cooling systems were not known or used commonly, our houses were built to automatically regulate the indoor temperature. Thick insulation and strategically-placed windows were used as natural insulation. But in modern construction, our heating and cooling systems are now responsible for maintaining the temperature indoors. In fact, they are the primary source of cooling as well as heating, making insulation a secondary concern. For instance, in many home constructions, builders purposefully cut costs by avoiding insulation. Adding insulation is no longer a tedious process. In fact the whole process to install takes less time than most people think. For instance, insulation in spray form can be installed into the attic, above existing insulation. This stops the cold from transferring through the roof. Similarly, some crawl spaces or basement in your house can also be a source of heat loss. You can avoid this by adding some special insulation panels to the ceilings of all of these spaces. If your home needs proper insulation to avoid losing heath and money, call Nexgen Air and we can utilize our high-quality materials to protect the interior temperature of your house. 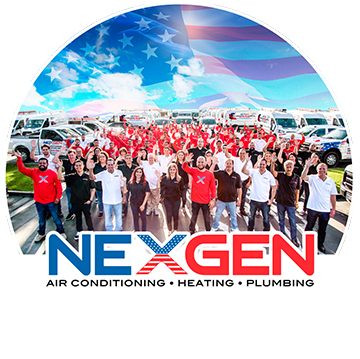 Give us a call at 833-3NEXGEN to schedule an estimate or make an appointment!